A Very Queer Book Launch! This Anthology is very much needed in a Maltese context. While we’re seeing more non-fiction books, there is little fiction with queer characters. Through Kitba Queer, we discovered that there is a slightly bigger pool of books which include queer characters…although, the pool is still small. That was one of the main inspirations behind the project - to widen and deepen this pool. There was also a funding opportunity. I knew about Creative Communities and I was getting and giving prompts to two friends and suddenly I thought, this is it, why wait? We Are - LGBTQQI Youth & Student Organization fully endorsed the idea and together - I, Mel, and We Are - applied. The project was then supported by the Malta Arts Council - Creative Communities. Why Kitba Queer, and not any other related title? Kitba Queer made sense. 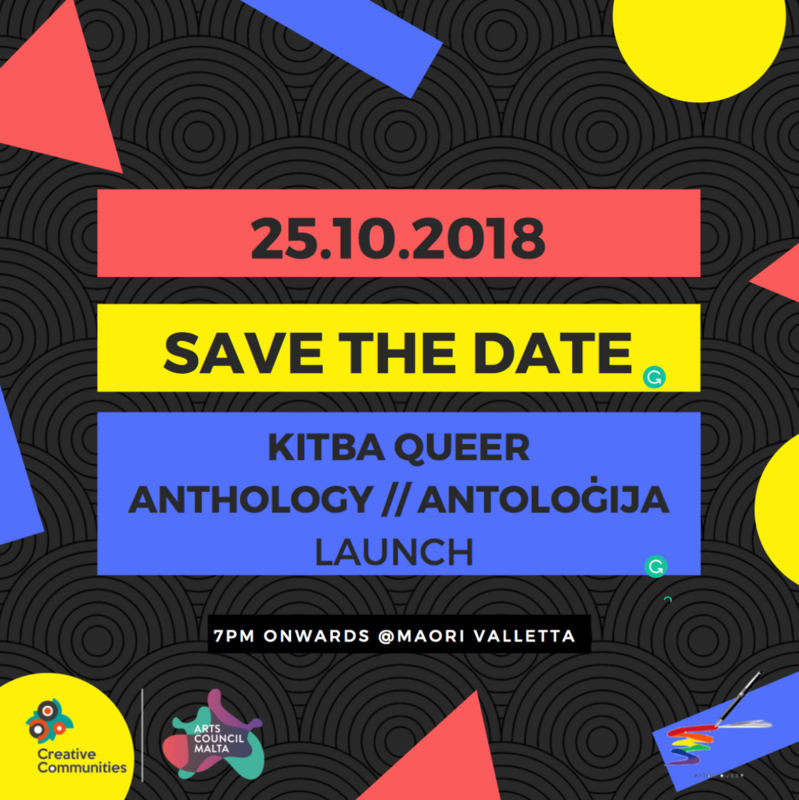 Kitba is in Maltese and Queer is a beautiful word, in my opinion. Queer, because while it was - and sometimes still is - used as an insult, it has been reclaimed by many. There is no other word that means what Queer does…and let’s be honest, Kitba LGBTQQI+ or Kitba GSM (gender and sexual minorities) or Kitba SOGI (sexual orientation and gender identity) don’t roll off the tongue like Kitba Queer! A lot of young queer authors and artists took part in producing content for this book; Can you list the obstacles that came in your way in the collection of these works or maybe during the publication stages of Kitba Queer? There were both logistical issues and content issues. During the project, we had Mingle & Create sessions, where writers and artists could work together on their pieces. We were going to offer some prompts and some guidance but wanted to leave them free to work on their own pieces. However, right after the first workshop on short stories, we realized that they may need more guidance. We researched some art and writing techniques and offered mini-workshops during those sessions, which I think paid off. From an illustration point of view, it was felt that that was lacking. We had to resubmit the open call for the cover twice. We also only had a few illustrations, so we made use of the artists who were already part of the Kitba Queer group and paired them up with writers. I just want to say that despite the obstacles that we had to overcome, his project also has a wonderful pool of volunteers; from the editor and designer, to proofreaders, and also the judges who selected the pieces. So we overcame these issues together and learned for the future. Any intention of publishing a second Kitba Queer with new works and authors? People are assuming that we are. Especially those who did not manage to publish this time round. I can see there is an interest in it - the response from this project was incredible. Let’s say we’re open to another publication. This will, however, depend on funds and also on the energy of the people behind the management of this project. In the meantime, we do publish and share current local queer fiction efforts on our Facebook page! What advice would you give to your authors who are maybe defensive and undecided when it comes to exposing their works to the world? That’s another reason why this project was started - it was noted that many people write or draw, but usually under a pseudonym. However, this gives the impression that Maltese people, especially youth, don’t write or that there is no queer fiction scene. This isn’t the case, and people need to notice these talented people. If you’re scared or ashamed, don’t worry. Start by showing your work to a few people out of your friend group. One thing that we emphasized during the project was to have your work critiqued by a variety of people, because their worldview is different from yours and they may offer more insight. Friends are great, but sometimes you need someone to be a bit more harsh. Probably there are people out there who want to read or see what you are working on. I am the participants’ number one fan! I love it when they send me things for opinions. Kitba Queer could not have been possible without the co-founding of the Arts Council Malta. This project strives to shed light and portray the lives of queer characters in a hetero-normative world where everyone still needs to come out and show who they really are. I think it is a great initiative since it brings these queer characters and their stories to life for the reader to enjoy.